You’ve finally selected your new flooring with Flooring Canada, and have scheduled a professional flooring installation with are flooring professionals. 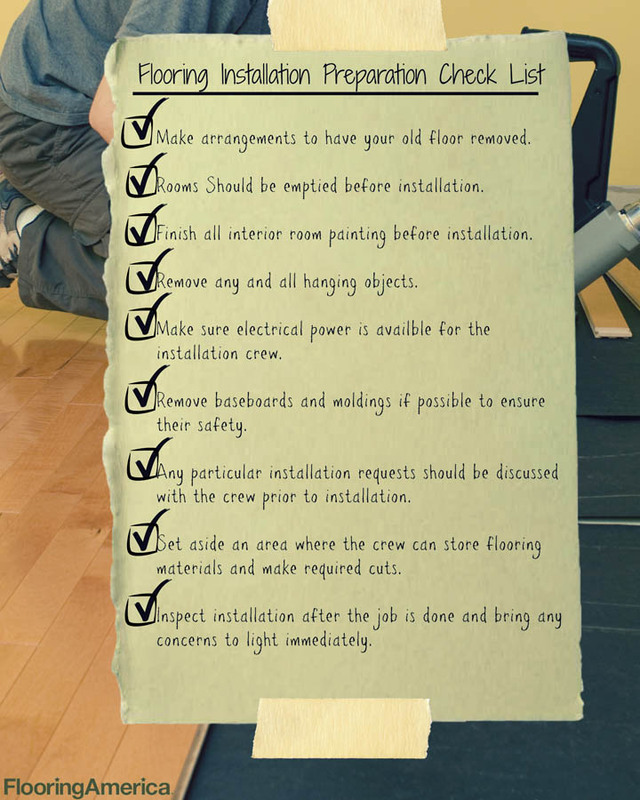 To ensure your installation goes as smooth as possible, consider using this handy pre installation checklist. Make an arrangement to have your old flooring removed. Rooms must be emptied prior to the arrival of an installation crew. If you’re completely remodeling your home, consider finishing all painting before your new flooring arrives. This will help ensure that your new floor doesn’t begin its new life with staining or damage. It’s recommended to remove any and all objects from the room, including hanging objects. This is to protect your valuables, in the event of hammering or procedures that can cause the walls to move. Be sure there is electrical power in the installation area to help power installation tools. Have other electronics disconnected and moved out of the room for your protection. Baseboards and moldings can remain where they are, but damage to them cannot hold the flooring installation professionals responsible. It is recommended to remove them if possible, as to ensure they do not receive any damage when your new floor is being installed. If you have a particular preference for the pattern or layout of your flooring, it should be discussed with our experts at the time of purchase to ensure the crew is ready and properly prepared the day of your scheduled installation. There should be access to an area where flooring materials can be cut and stored. If your installing your new floor during in climate weather, the area should be inside. Inspect the flooring post-installation and bring any concern to the installers immediately. Allow your floor to properly settle after installation. This can take up to 72 hours, and varies depending on the flooring option you chose. Hinged doors may require trimming for proper clearance once a new floor is installed. Be sure to control the humidity of the room once a new floor is installed. This is especially important for hardwood flooring. If your floor was installed using adhesives, be sure to allow proper ventilation to remove the fumes from your home. After your flooring installation, your moldings and baseboards might require a touch up. When you choose Flooring Canada, you’re not only getting the excellent selection of flooring at exceptional costs, but you’re also getting the option for world class flooring installation from industry professionals.